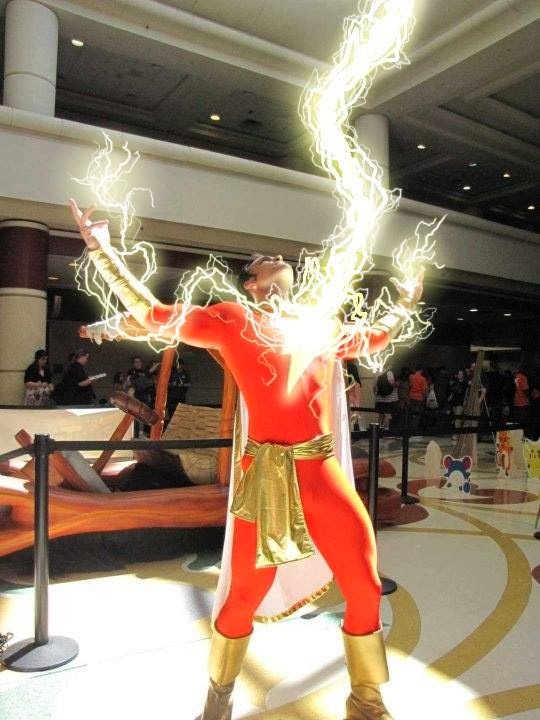 It's A Dan's World: NOW COMES THE COSPLAYER: Green Goblin, Cassandra Cain, Scarlet Witch and Shazam! NOW COMES THE COSPLAYER: Green Goblin, Cassandra Cain, Scarlet Witch and Shazam! Christmas is on the horizon and all around you, you can feel the odd person or people turning into Grinches. I know I do every time I hear carols, but that's just me. If more were sung with a reggae beat or electric guitar, I'd be more inclined to listen. In comics and cosplay there are Grinches too, and none so famous as The Green Goblin. Found on GeeksAreSexy, this guy has taken a comic book classic and not only 'become' the character, but added his own flavour to the look of Spider-Man's arch-nemesis! If Spidey can't stop Norman from wrecking his local 'Con, maybe a harder edge is needed, like Cassandra Cain/Batgirl perhaps? No Mans Land is one of the best Batman-storylines ever, and this faceless Batgirl outfit, first worn by The Huntress, then Ms. Cain is it's best and longest lasting aftershock. From the deviantARTist's Dangerous Ladies, none fit the term better than she. SHAZAM! Now that's how you cosplay Captain Marvel! Supplied by cosplayer Jay Tallsquall himself, this pic shows why he needs to take this show on the road. He's the perfect fit for the World's Mightiest Mortal - he just might have to swap out the Flintstone car for a Honda to do it! they all look great! but that Scarlet Witch cosplay is so damn pretty and the Captain Marvel cosplay guy looks like he could have modeled for illustration references for Alex Ross! I was thinking the same thing after seeing him Shlomo. Damn does he look like he stepped out of Kingdom Come or what? The Scarlet Witch and Green Goblin come in close 2nd for me. You know what Dave - I thought he'd be a great Alex Ross reference too! That's a lot of red spandex in one place - but it sure works. The Scarlet Witch too, with the way the cape is blowing, looks like a Adam Hughes number. I shave my hair too short for the wind to make a difference, but here it makes for great timing! 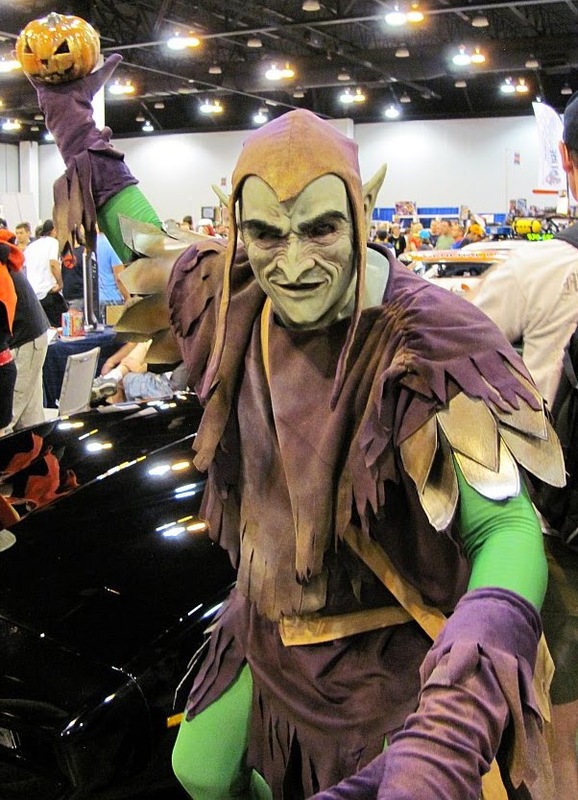 My favourite's the Green Goblin Dale. Hobby will always be my favourite, but I dig the way this guy took a little artistic license when it came to the costume. It looks better than the old movie version don't you reckon? I'm with you Dan, that Green Goblin is my favorite. Not just because his costume is awesome, but his paint job looks good. And if you've ever tried smearing paint EVERYWHERE, you know that's hard. I'm writing in a lot of CAPITAL LETTERS today. Thanks Random - and hey who doesn't like the classic Spider-rouges right? As hard as submarine paint? That's not hard, that's stupidity. Captain Marvel is Jay Tallsquall - he does lots of different characters. Google him for all his stuff. Thanks Anon - Jay himself has been in touch and graciously supplied the finished version to this photo of Captain Marvel. He definitely has done a stunning range of characters, and do doubt will do many more!